What Is a DD Form 1351-2? DD Form 1351-2 or Travel Voucher or Subvoucher is a legal form issued by the U.S. Department of Defense. The voucher contains a full description of a service member's travel routes and costs along with personal information that allows them to get reimbursed for their expenses. The DD 1351-2 - often incorrectly referred to as the DA Form 1351 - replaced the previous DD Form 1351, Travel Voucher adopted in July 1999. 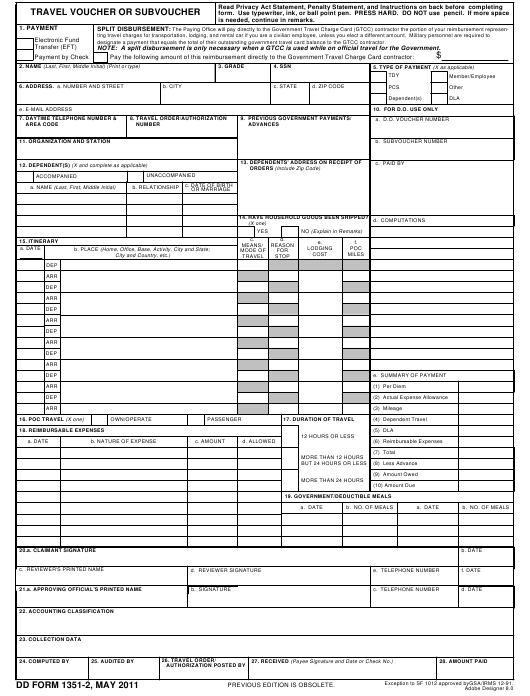 The latest version of the form was released by the Department of Defense (DoD) in May 2011 and is still valid and in use today. An up-to-date fillable DD Form 1351-2 can be downloaded below or supplied through the chain of command. The DD Form 1351-2C, Travel Voucher or Subvoucher (Continuation Sheet) is a separate document used for adding an additional page to the original form. The form was introduced to the DoD database in August 1997 and can be accessed through the link above. The DD 1351-2C includes extra space to describe the service member's travels. It is added to the DD 1351-2 in cases when there is not enough space for the travel itinerary on the main form. How To Fill Out Dd Form 1351-2? is needed, continue in remarks. designate a payment that equals the total of their outstanding government travel card balance to the GTCC contractor. Exception to SF 1012 approved byGSA/IRMS 12-91. Volume 9; and E.O. 9397 (SSN), as amended. official Government business purposes and to account for such payments. 287 and 1001 and Title 31, Section 3729). claimed in Item 18 as a reimbursable expense. made to travelers only when EFT payment is not directed. Enter the total cost for lodging. 2. Two copies of dependent travel authorization if issued. will not reside in your household after travel. 4. Copy of GTR, MTA or ticket used. than a government mess (see JFTR, par. U4125-A3g and JTR, par. amount of $75.00 or more. 6. Other attachments will be as directed. b. ALL UNUSED TICKETS (including identification of unused "e-tickets") MUST BE TURNED IN TO THE T/O OR CTO. Start with choosing the payment method in Box 1. The Paying Office will send payments to a Government Travel Charge Card (GTCC) or pay by check. Boxes 2 through 11 are for your personal information. Enter your name, grade, SSN, full address and other required information into the corresponding boxes. Leave Box 10 blank. List all of your dependents in Box 12, and point out if they had accompanied you during this trip. Dependent's address on receipt of orders should be listed in Box 13. The next step is to mark whether household shipments were included in your expenses. Describe travel itinerary, mode of transportation and the duration of your trip in Boxes 15, 16, and 17 respectively. The columns Means/Mode of Travel and Reason for Stop require an appropriate two-letter code. You can itemize all of your reimbursable expenses in Boxes 18 and 19. Date and sign your voucher. In order to be valid, you form has to be signed by a reviewer and an approving official. If you ran out of space for the description of your routes, meals or other expenses, use the DD Form 1351 2 for continuations. Box 29 is for any remarks you may have. You can only complete both of the DD 1351-2 forms using a ballpoint or ink pen or computer. DD Form 1351-3, Statement of Actual Expenses is another form in the DD Form 1351 series. This document contains a detailed table of reimbursable expenditures. Here you can describe your lodging expenses, meals - excluding alcoholic beverages - laundry, and local transportation costs. The DD 1351-3 also has separate columns for other spendings, including reservation charges, tips given to porters, baggage carriers, hotel employees etc. DD Form 1351-5, Government Quarters and/or Mess is a form used to determine if government quarters or mess facilities were available during the period of travel. All data in this form may be used by law enforcement to prevent fraud. The authorities can find out if the claimant is entitled to reimbursement for travel expenses according to the information provided. The disclosure of this data is voluntary, but failure to provide it may result in denial of the claimed amount. DD Form 1351-6, Multiple Payments List is a supplemental form used along with the DD Form 1351-2, Travel Voucher or Subvoucher. How to fill out a DD Form 1351-2 for ETS? Select OTHER as the type of payment in Block 5. Use the codes from the second page of the document to fill in Columns C, Means/Mode of Travel and D, Reason for Stop in Box 15. The last entry in Column D should be MC (mission complete). A reviewer's signature is not necessary for your ETS travel claim, so you may leave Box 20 Lines C through F blank. Where to send DD Form 1351-2? Upload your travel voucher and supporting forms online with Travel Voucher Direct on the DFAS website. Printed documents can be sent to the DFAS mailing address at DFAS-IN Dept. 3300 ATTN: COR/Claims 8899 East 56th Street Indianapolis, IN 46249-3300. What goes in Line "Reason for Stop" on DD Form 1351-2?